Foothills Sports Medicine and Rehabilitation is a state-of-the-art physical therapy clinic that prides itself on individualized care and "hands-on" physical therapy. Since its inception in 2000, Foothills Sports Medicine has successfully rehabilitated acute and chronic injuries, ranging from auto accidents to overuse injuries. Prior to its inception, the founder of Foothills Sports Medicine, Michael Basten PT, ATC, CSCS, worked in the greater Phoenix area for 10 years with amateur and professional athletes including Diamondbacks, Cardinals, ASU Athletics, and Professional Hockey Leagues. Thank you to Foothills Sports Medicine for Sponsoring the Gators in the Holiday Classic Tournament. 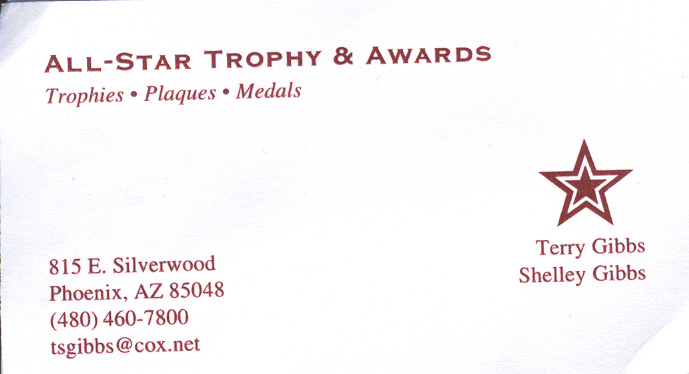 Maker of fine trophies and awards. All-Star trophy & Awards "donated" time and materials to add our team name and player names to the 2003 SEV Championship Trophy. Thanks Shelly. Were a world leader in managed services... We provide food facility and other support service, and uniform and career apparel.